Crostini with crab salad and olive oil is light, quick and simple appetizer for your next party. Clean crab meat of their shells, and put in bowl. Add oil, bell pepper, chives, basil, lemon juice and zest, and mix well. Set aside while you prepare the crostini. Finely chop garlic and sprinkle with salt, then mash together into a paste. In small bowl mix softened butter, lemon juice, and the garlic paste. Then season with pepper. Wrap mixture with plastic wrap and refrigerate until ready. Preheat oven to 360 degrees F (180°C). Spread bread slices with garlic butter. Bake for 10 minutes, then broil tops for just about 1 minute. 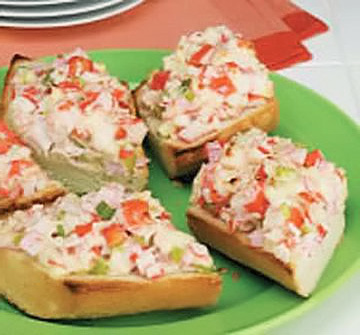 Let crostini cool before spreading with crab salad. Place on a platter and garnish with a few fresh basil leaves. Drizzle extra olive oil. Enjoy!